The latest BA (British Airways) news - to get BA flight offers and other airline news emailed to you, subscribe to our (free) flights mailing list. 2017-06-30: The British Airways mixed cabin crew strike will go ahead tomorrow and only end on the 16th of July 2017. As the airline still hasn't met salary and benefit demands or re-instated those staff members who previously participated in strike action, we're not sure the problems will be resolved any time soon. The airline has confirmed that South African flights won't be affected. They have also taken measures to protect London City Airport and Gatwick flights. In an attempt to minimise disruptions at Heathrow the airline has merged several flights and will notify affected passengers of their options. Passengers are however adivsed to keep an eye their flight schedule irrespective of departing airport or desitnation as unforseen matters could lead to cancellations or delays. 2016-03-30: From the 10th of May 2016 British Airways are reducing the Business class free luggage allowance from 3 pieces weighing no more than 32 kg to 2 pieces weighing no more than 32 kg. Passengers who made bookings prior to this date will still be allowed three pieces. In other situations passengers in Club World and Biz Bed will have to pay an additional £120-£200 for an extra bag. Gold cardholders in BA’s Executive Club scheme will still be able to check in one additional bag. 2016-03-30: British Airways are introducing seasonal direct flights between Cape Town and Gatwick airport this November. There will be three weekly flights operated on a Boeing 777. 2016-03-01: British Airways will no longer accommodate unaccompanied minors. Children under twelve will no longer be able to travel on their own with British Airways. The airline will still offer the service to travellers twelve years and older, although they noted that few passengers choose to make use of the service. This does not apply to British Airways flights operated by Comair. 2016-02-18: Comair has signed a codeshare agreement with Qatar airlines that allows the middle Eastern airline to put their code on British Airways operated by Comair flights from Johannesburg to Cape Town, Durban, Port Elizabeth, Harare and Victoria Falls. Qatar will also add their code on flights from Cape Town to Durban and Port Elizabeth. This will allow passengers seamless connections from domestic flights onto the international flights. 4 February 2016. From the 1st of March all British Airways operated by Comair flights will close 45 minutes before departure, and not 30 minutes. This will be applied universally to all British Airways flights. No exceptions will be allowed. 26 October 2015. A British Airways boeing 737 is stuck on the runway at OR Tambo and causing some delays after it crash landed earlier today. It hasn't been confirmed, but passengers report that the plane's left landing gear failed or broke off resulting in a bumpy crash landing. Sparks flew as the wing and engine scraped agains the tarmac. This plane is currently causing delays of about 30 minutes at OR Tambo as an alternative runway has to be used. 9 September 2015. British Airways passengers in Las Vegas was left slightly traumatised yesterday after their plane broke into flames shortly before takeoff. The plane was still on the tarmac when one of the engines failed and caught alight. The 159 passengers and 13 crew members all had to be evacuated via the emergency slides. Around 50 firefighters did manage to extinguish the flames. No major injuries have been reported and most minor ones were sustained during evacuation. 4 August 2015. British Airways has changed the requirements for the secondary, smaller cabin bag. Passengers are now allowed to travel with two cabin bags, one main bag weighing up to 23kg and no larger than 56x45x25cm, and another secondary bag no larger than 45x36x20cm. The secondary bag is usually a laptop bag or handbag. The airline has reported that people often overload the overhead storage on the plane which causes delays when the luggage has to be moved. This only affect international British Airways flights and not their domestic services offered by Comair. 19 Feb 2015. British Airways are reviewing their Voyager Miles program, specifically the way you earn. Instead of earning miles based solely on the mileage you travel you will now be earning percentages thereof depending on the booking class you are travelling on. Those travelling on the most expensive full-fare first class ticket will earn three times the mileage travelled, business class travellers will earn 2,5 times the mileage travelled whilst premium economy class travellers can earn up to 1,5 times the mileage travelled. In contrast those travelling on the cheapest economy fare will only 25% of the total mileage travelled. American Airlines and Aer Lingus will also consider adopting the new system. At 3pm on the 5th of Feb 2014, a British Airways A380 does 2 Table Mountain fly-bys, as the airline wants a photograph with an instantly recognisable background. 13 Jan 2014. Remember last year when Bryan Habana raced an A380 and won? Now British Airways are running the same competition again, but anybody who is medically healthy enough can enter. Click here to enter and say in 50 words or less, why they should choose you. 12 Jan 2014. British Airways Comair Groups no longer accepts VMPDs for paying of group bookings. 29 Dec 2013. A comparison of the British Airways credit card against the Kulula credit card and earning Mango vouchers with a Nedbank credit card. 19 Dec 2013. British Airways is to become Europe's 1st airline to let passengers use electronic devices at takeoff and landing. So, pax will be able to be online on their cellphones and tablets throughout the flight. This follows an EU Safety Agency ruling that tablets & smartphones can be safely used at takeoff and landing. “We are incredibly pleased to be the first airline in Europe to introduce these changes which will be of great benefit to our customers on any British Airways flight anywhere in the world.” said BA's flight training manager, Ian Pringle. 6 Dec 2013. British Airways Comair has won ACSA's Feather Award for the best full service carrier in South Africa. 15 Nov 2013. BA's second A380 is flown on the London to Hong Kong route. October 2013. British Airways expects to have completed the refurbishment of its lounges at Cape Town International Airport. 15 Oct 2013. BA's first A380 is flown on the London to Los Angeles route. 2013-09-02. BA Executive Club members can earn Avios points on Qatar Airways flights. 2013-07-05. British Ariways takes delivery of its first Airbus A380, with it coming in to land at London Heathrow Airport. 2013-06-30. BA commences 2 weekly flights to Larnaca from London Gatwick. The flights are in A319s. 2013-06-12. BA announces that it has increased its JNB - London flight frequency by 3 to 17 flights a week. May 2013. British Airways Comair commences flights from O.R. Tambo International Airport to Maputo. 21 Apr 2013. British Airways places an order for 18 Airbus A350-1000s, and options for 18 more. Jan 2013. Genius BA advertisement targets travellers whilst at the exploratory stage. British Airways increases the frequency of its CPT-LHR flights from 7 to 14 a week. BA Comair was meant to introduce 3 extra JNB - Harare flights on Wednesdays, Thursdays & Sundays (leaving JNB at 18h40, arriving HRE at 20h20). Harare to Johannesburg flights are scheduled to leave at 07h00 & arrive in Joburg at 08h40 on Mondays, Thursdays & Fridays. On 3 April 2012 we heard from Comair: "We have applied for the additional 3 frequencies to Harare (this is a bilaterally constrained route) and will be having our hearing before the licencing council quite soon. We hope to be in a position to add these flights to our schedule should we be successful in securing these rights." Woolworth meals are no longer being served on board British Airways Comair flights. Instead, Food Directions, Comair's homegrown catering company, will be providing the food. British Airways passengers travelling on regional flights from Johannesburg's O.R. Tambo International Airport will need to check in at Terminal B. Flights on the the following routes are affected: JNB-Harare, JNB-Victoria Falls, JNB-Livingstone, JNB-Windhoek & JNB-Mauritius. British Airways increases its Johannesburg - London doubly daily flights by 3 a week, adding 700 seats. From 11 February 2012 BA Comair is suspending its JNB - Nelspruit flights. British Airways Comair ends flights between Johannesburg Lanseria and George. British Airways Comair ends flights between Johannesburg Lanseria and Maputo. British Airways Comair commences Johannesburg Lanseria to George flights. George Gray's complaints about BA flights are dismissed by the Advertising Standards Authority. Mr Gray alleged that he couldn't select seating of his choice without paying an additional R283/seat, and couldn't utilise his BA Miles in 2 instances. BA's Conditions of Carriage state that where it issues “a ticket without a reservation being specified on it, you may make a reservation later but whether you will be able to do so will depend on our tariff and whether a seat is available on your chosen flight”, and its Executive Club bookings are subject to availability and cannot be waitlisted. BA introduces a bronze tier into its Executive Club, offering qualifying members a 25% tier bonus, seat selection 7 days prior to departure and a business-class check-in. British Airways changes from 13 Cape Town to London flights a week, to double daily. At the same time, it changes to Boeing 747-400 aircraft, making it the only airline offering a first class service on the route. BA runs a pilot recruitment program on Youtube: "This is a very exciting time for BA. We're entering a phase of growth with new aircraft coming into service, near products for our customers, and new routes. This is British Airways' biggest pilot recruitment drive in over a decade. Over the next 5 years we aim to recruit more than 800 pilots. The cost of professional pilot training is in excess of a hundred thousand pounds. The future pilot programs enables anybody from any background regardless of their financial background to pursue their aspiration to be a pilot with British Airways". Comair British Airways reduces its Joburg to Dar es Salaam flights from 5 to 3 a week. British Airways planned to commence flights from Johannesburg Lanseria to Maputo (8 return flights a week) and Gaborone (7 return flights a week) from 30 May 2011, but postponed the launch to 1 Sep 2011: “We regret the decision to suspend the launch of our Gaborone and Maputo flights as our team has worked tirelessly to ensure that the new routes reach operational readiness in time.” said Executive Manager for Network Development and Alliances at Comair, Stuart Cochrane. Sixty six seat ATR72-212 Turboprop aircraft are used, leased from Solenta Aviation (a privately owned support services airline flying turbo-prop aircraft). Stuart Cochrane, a Comair executive, said that "This will add huge value to our customers travelling on these new routes by allowing them to complete a full day's work in the countries and return on the same day without having to incur accommodation expenses. We believe our partnership with Solenta Aviation who has an outstanding reputation of operating turboprop aircraft in the industry will continue to grow to include additional aircraft and more routes from both Lanseria and other potential hubs within southern Africa in the future. We are confident that the implementation of this first phase of expansion to our African network will be well-received by our customers and provide them with an alternative to current regional flights operating from OR Tambo International Airport." Kulula flights on the Cape Town - Port Elizabeth - Durban route are taken over by British Airways. BA commences 5-weekly Johannesburg-Dar es Salaam flights, to be sold through the Kulula website. BA plane slips off the runway at Durban Airport. BA starts Johannesburg-Nelspruit flights in Boeing 737-300 aircraft . The threatened date of a British Airways strike for 12 days, which was ruled illegal on the 17th Dec 2009. BA offer to fly from Johannesburg or Cape Town to London from R4,380. BA introduces a system whereby you have to pay for reserving a BA seat in advance. British Airways decreases its flights from London to Johannesburg from 19 back to 14 flights. Asheley Cowen, the BA general manager for Asia-Pacific & Africa, announces that BA has gained an additional 4% of the UK - South Africa flight market by introducing more flights (it increased its frequency of flights between London & Johannesburg from 14 to 19 on 1 May 2009). BA-56, a Boeing 747-400 en-route from Johannesburg to London, dumps fuel and returns to Johannesburg after 2 reverse thrusters are indicated unlocked after takeoff (engineers later determined that the indications were false). BA increases its weekly flights between London Heathrow and Johannesburg from 14 to 19 flights. It's announced that British Airways will be the official sponsor of the British & Irish Lions tour to South Africa in 2009. BA will fly the team and the coaching staff to South Africa and within South Africa (through Comair). Flight BA6409 from Johannesburg O.R. Tambo International Airport to Cape Town, lands without its flaps down. The Boeing 737-400 first aborted landing when it found it could not extend its flaps to landing position, and diverted to near Robben Island where they dumped fuel and tried to fix the problem. When the problem persisted it landed with slats and first stages of flaps, but not landing flaps (which meant a much higher landing speed). The plane landed safely and nobody was injured. British Airways PLC & Iberia announce that they are in merger talks. 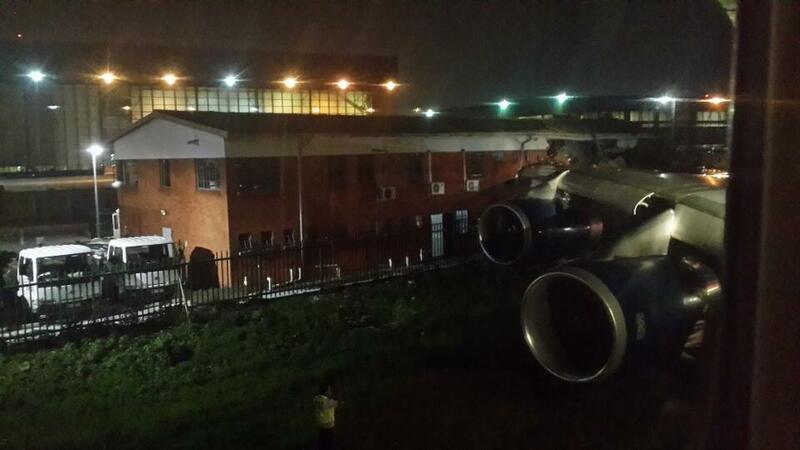 British Airways plane slips off runway at Durban Airport. British Airways usually cheapest from Cape Town to Johannesburg. The first service from London to Cape Town, as an Imperial Airways (the predecessor to British Airways) biplane lands in Cape Town after a flight from London. The plane was carrying mail.